Reserve Memories examines how myths and narratives about the past have enabled a Northern Athabaskan community to understand and confront challenges and opportunities in the present. For over five centuries the Chilcotin people have lived in relative isolation in the rich timberlands and scattered meadows of the inland Northwest, in what is today known as west central British Columbia. Although linguistic and cultural changes are escalating, they remain one of the more traditional and little known Native communities in northwestern North America. 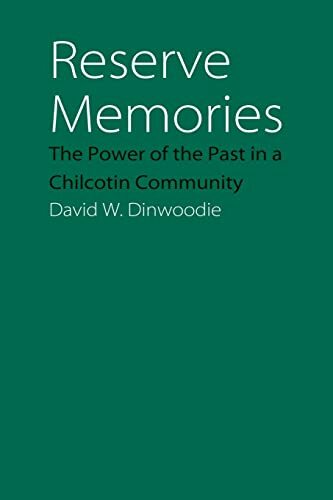 Combining years of fieldwork with an acute theoretical perspective, David W. Dinwoodie sheds light on the special power of the past for the Chilcotin people of the Nemiah Valley Indian Reserve. In different social and political settings, they draw upon a "reserve" of memories-in particular, myths and historical narratives-and reactivate them in order to help make sense of and deal effectively with the possibilities and problems of the modern world. For example, the declaration of the Chilcotins against clear-cut logging draws upon one of their central myths, adding a deeper and more lasting cultural significance and resonance to the political statement. David W. Dinwoodie is an assistant professor of anthropology at the University of New Mexico. His articles have appeared in Anthropological Linguistics and Cultural Anthropology.